You might remember that the 12 in 11 challenge requires me to buy no more than 12 items of clothing in 2011. This is the February update. I bought nothing this month. Nothing. The only clothes I acquired were the socks I've just finished knitting, and they're disqualified from inclusion for two reasons - firstly just because they're socks which don't count, and secondly because they're hand-made. Yippee! I still have eleven items I can buy over the next ten months. I've said before that I'm good with deadlines - by which I mean I'm good at delivering whatever it is that has the deadline at the last moment. In this case it's not quite the last moment, but it is the last day. So here they are - my Shur'tugal socks, the first socks for the Super Special Six Pattern Sock Club 2011 (s62011). They were due on the last day of February, and here they are. I've knitted them from Knitabulous's supertwist merino yarn, using 2.5mm needles (dpns). * I love the yarn. 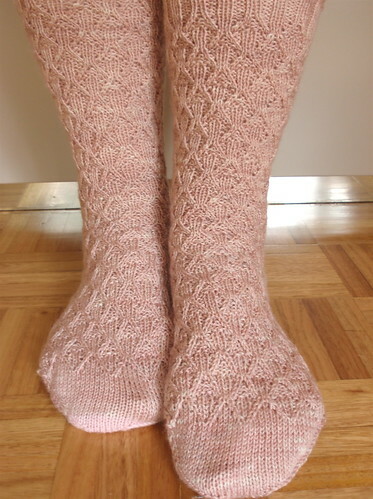 In particular, I love the slightly brownish pink colour of the yarn, so perfectly named 'Pink Salt". * I like being challenged to knit outside my usual choices, which for socks is usually something quite classic. * This is a clear, well-written pattern. * I think the heels of these socks, with their gothic window patterning, formed by varying the texture of knit stitches, are most ingenious. * I don't like richly patterned socks. The twist stitches result in quite a dense fabric which, while interesting to look at, is less comfortable to wear. However, the fabric has relaxed somewhat with soaking and blocking. * I needed a size halfway between the large and small versions of this sock. I knitted the large size, which is slightly too large for my foot. But I'm pleased I made this choice, as I think the smaller size would have been too snug. I probably should have knitted the larger size on smaller needles, but I was worried that would produce too dense a fabric. 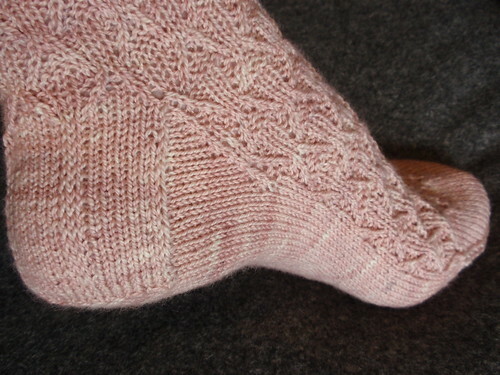 * I ran out of yarn with six rows to finish on one toe. I'm pretending this didn't happen. 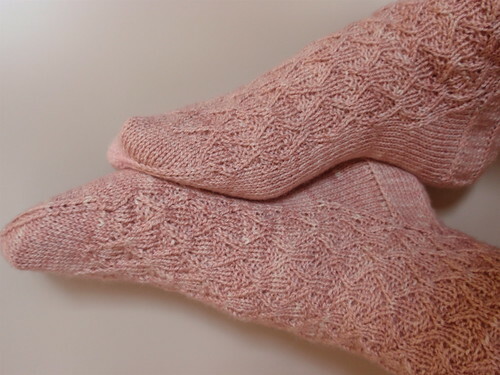 I found some generic pale pink yarn I've had forever and finished the toe in that. That's the last you'll ever hear about this problem. It didn't happen. * I had to concentrate quite a lot to knit these socks. Though the pattern is logical, without concentration I was quite likely to take off on the wrong row from time to time. I reckon I must have knitted at least an extra sock with all the picking back and reknitting I had to do. So, that's my first sock for s62011. Because I'm playing absolutely by the rules I'll not unpack the yarn for my next s62011 socks (Nutkin) till tomorrow. And a footnote (no pun intended). The shoes I had to buy to accommodate the heel cups I'm wearing to deal with my heel spurs also accommodate thick knitted socks. So, once I'm recovered from the heel spurs (which I have to believe will happen one day) I can use these shoes with knitted socks. So I did order the DVD of Fortunes of War. And the BBC sent it to me super-quickly. And it was just as good as I remembered. I'm hopeless at practicing delayed gratification, and so I watched my way through the whole series as soon as I possibly could. The performances are excellent - you can already see in Emma Thompson and Kenneth Branagh the skilled performers they would become. The series has been filmed on location and while all the settings are riveting, the winter scenes in Romania are exquisite. The beginning of the series, when newly wed Guy and Harriet Pringle are getting to know one another, and coming to terms with the strangeness of finding themselves elsewhere, are the best. Though the Egyptian settings of the latter part of the series are extraordinary, the divided focus of the story between the Pringles and young soldier Simon Boulderstone (a very beautiful and very young Rupert Graves) rather fragmented the narrative. The series if full of knitting. Harriet is a knitter and she and Guy often wear knits - cardigans, vests, scarves. The knitwear is not particularly beautiful - it's just there because that's what people wore in 1940. There's so much for me to like in this series. Most immediately, it's made me want to visit Romania. In winter. But I guess that's not going to happen for a while. I read relatively quickly, and I read every day. I can't get to sleep unless I spend some time in bed, reading. So, I often run out of things to read. 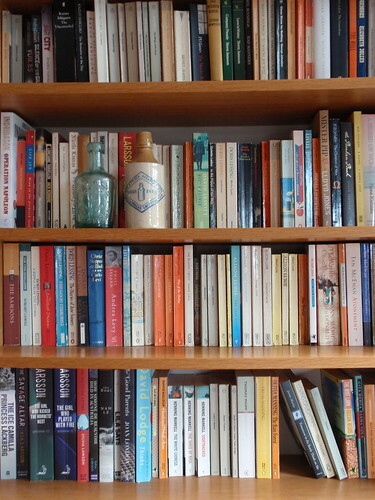 Even with the temptations of the Bookshop of Doom, and the pleasure of regular book-swapping with friends, from time to time I find myself re-reading books I've enjoyed. Perhaps fortunately, I have quite a bad memory for the detail of books I've read. I'm much more likely to remember the emotional tone of the book than I am to remember the details of the plot. Maybe this is the downside of reading in bed late at night? Anyway, I'm one of those readers who often reads the end of a book when I'm only half-way through, so clearly I'm not deterred from reading by knowing how things end. And because I only re-read books I've enjoyed, I can take delight from re-reading. Just now, I'm feeling comforted by re-reading (for the third time? the fourth time?) The Balkan Trilogy by Olivia Manning. And when I've raced through the three volumes of this trilogy I have 'The Levant Trilogy' to look forward to. These six novels, that were written between 1960 and 1980, follow the lives of a young English couple, Harriet and Guy Pringle, who become trapped in Romania by the German eastward advance at the outbreak of the second world war. Under increasingly harsh conditions they are evacuated to Greece and then to Egypt. There's much to be critical about with these novels. They have a very uneven attitude to racism and colonialism - though there is always the concern about importing one's own 21st century attitudes to a different time and place - and the writing is often cliched. But I'm captivated by the two central characters and by the depiction of the change in their relationship over time, and I find the investigation of how people adapt when they are strangers in other lands totally engrossing. 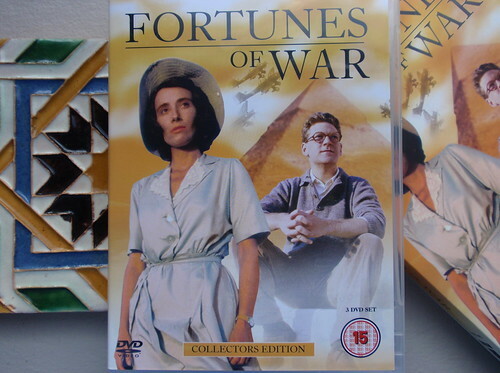 In 1987 the BBC made a wonderful television series of the two trilogies under the title Fortunes of War. It starred two young and at that time relatively unknown actors, Emma Thompson and Kenneth Branagh, and has remained in my memory as one of the high spots of television viewing, ever. I have such good recollections that I've ordered the DVD of the series. I'm hoping my re-viewing is just as pleasurable as my re-reading. The other book I've recently re-read is Christina Stead's 1940s novel, 'The Man Who Loved Children'. A few months ago my book group read Jonathan Franzen's recent novel, 'Freedom' - about which we were all a bit ho-hum, but that's another story. In reading some on-line reviews of the Franzen book, I discovered his praise for 'The Man Who Loved Children'. I think all my book group had read the Stead novel at some time in their lives - usually the very distant past - but we decided to read it again. I have great fondness for my book group, but I must admit that we are a bit lazy. We're all avid readers but feel we've got to a stage of our lives when reading should simply be pleasurable. We don't often challenge ourselves with our book choices. But after reading and discussing 'The Man Who Loved Children' we all agreed that in this case we were delighted that the book group had pushed us to such a dense and rewarding read. Tolstoy's well-known dictum that 'All happy families resemble one another, each unhappy family is unhappy in its own way' is given a thorough workout in Stead's novel. It's well-known that 'The Man Who Loved Children' is a reworking of aspects of Stead's own childhood - particularly through the central character of the father, Sam Pollitt. Sam is charismatic, energetic, idealistic and ultimately narcissistic, controlling and selfish. He enthralls his children, but forces them to comply with his image of them. Henny, the mother within the family, is discontented, unhappy and sharply bitter. They struggle with poverty, but are improvident with the money they do have. There's a bleakly hopeful ending for Louie, the oldest daughter of the family (the Christina Stead character? ), but the reader despairs for the fate of some of the other children. 'The Man Who Loved Children' is not an altogether easy read. I'd forgotten how florid and elaborate the style of writing is - even though it's also often beautiful and moving. And the novel is long and repetitive, though you can argue that the repetitiveness is exactly what reveals the full horror of Sam's interactions with his children. But the need to know what happens and what new awfulness will be revealed carries you along. I agree with Jonathan Franzen that it is a mystery why the novel is not better known and more highly regarded. I think it's a wonderful read (and re-read). 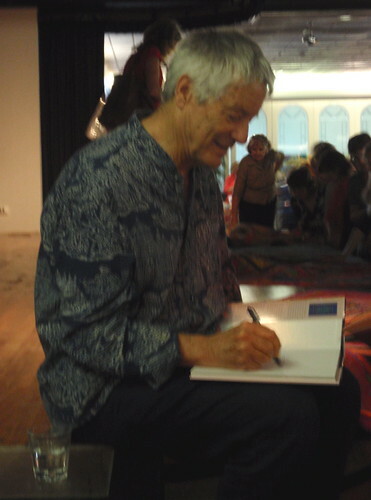 Today, with a couple of knitting friends, I went to hear a presentation by designer Kaffe Fassett. It was a simple format - a lecture illustrated by still photos. But it had the kind of excellence you get when someone is absolutely knowledgeable about the content of their talk, and so aware of their audience and what they want to hear that the talk flows naturally and entertainingly. Real mastery. 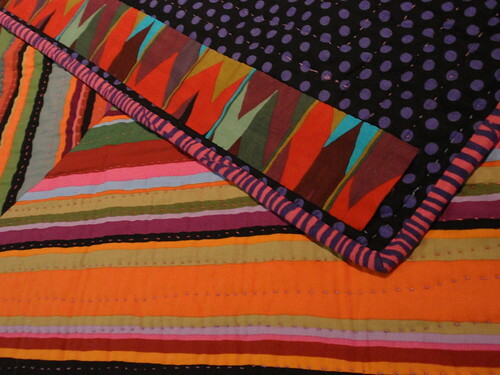 I've written before about the unexpected pleasure of discovering Kaffe Fassett's work (along with thousands of others) in the 1980s. This talk and the slides had everything I expected from Kaffe Fasset. Lots of fearless colour; injunctions to see the world around you and the richness of its patterns; a delight in the excess of pattern and colour; and the pleasure of imperfections. But it was also clear that Kaffe works hard and relatively systematically, and that he is undaunted by the techniques behind his work. I think this is what I most envy him; the capacity to embark on such a range of textile and other crafts - knitting, needlepoint, quilts, mosaics - with confidence that his technique will be good enough to have the impact he wishes. 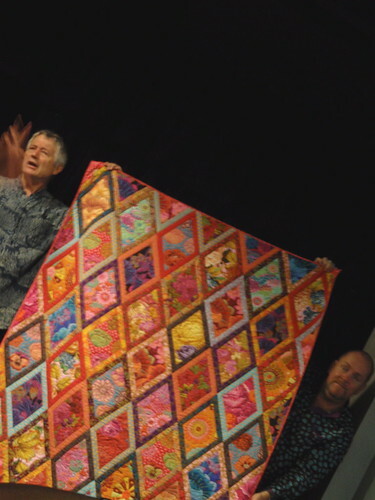 The occasion had been organised by quilters, and so there was an emphasis on quilting, and some wonderful examples of quilts. But many of the photos were of knitting and there was great inspiration to be gained from the colours and the combinations of patterns. The talk and the relaxed Q&A session afterwards passed in a flash. It was a wonderful way to spend Sunday. My head is full of ideas.